Resweater: The wool blends sweater challenge & everything blends! The wool blends sweater challenge & everything blends! This week's Sweater Sunday theme will be blends! ... did not felt. It did get a little smaller, so it may have felted after more washings, but it was a dud for this challenge. ... did not felt! This one surprised me, since it was the highest animal fiber content out of them all. It did get a little smaller & fuzzier, so it may have felted after a couple more washes, but for this challenge? Dud. Felted great! 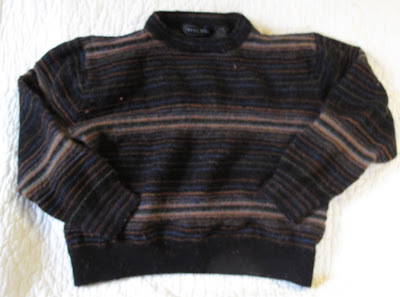 This was a large mens sweater, and wouldn't fit on my 5 year old now! ... lightly felted. I have a feeling it would have felted up nicely after another wash or 2. 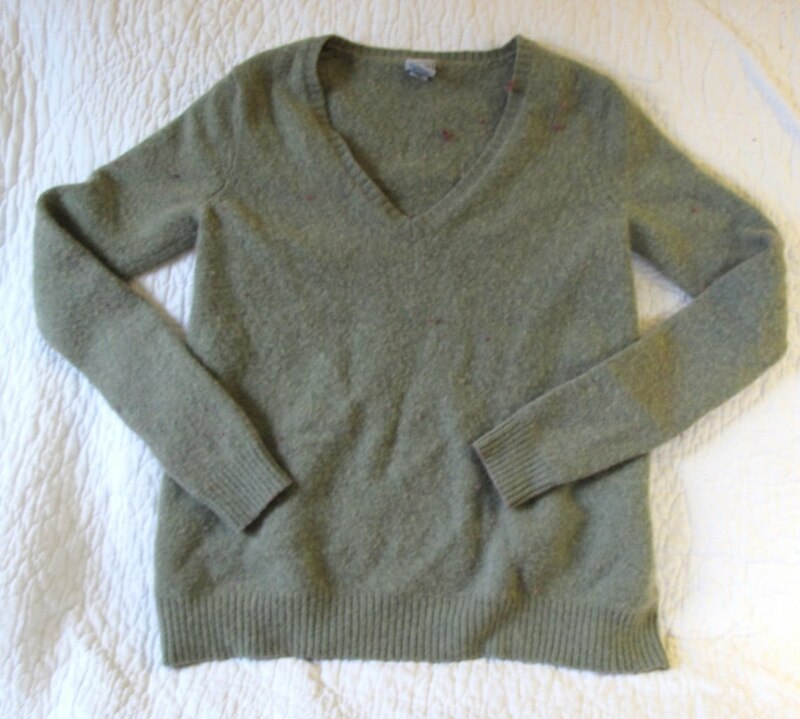 The tag is hard to read, but this sweater has only 40% animal fiber contest, and felted beautifully! Now these results were with very low blends, but I just wanted to demonstrate that blends felt. In my shop I only sell blends of 70% or higher animal fiber, so they will predictably felt. As for functionality, like diaper covers, obviously the higher the animal fiber contest, the better, but you can use high blends. My son has a couple of wool soakers that work great and are 80% lambswool/20% nylon. The only thing to keep in mind with that, it that the other fiber can't be an absorbent fiber, like cotton or silk, or your diaper cover will not work. Stick to synthetics, like nylon & polyester. 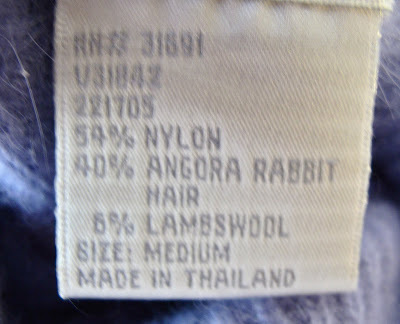 One of my favorite blends is 70% lambswool/20% angora/10% nylon. It is a common blend, is super soft (often feels similar to cashmere), and felts soft & drapy, like cashmere does. It is excellent for clothing and diaper covers. Why should you buy blends, when there are 100% wools available, you ask? Blends tend to come in fun colors & prints more often than the 100% wools do, and if you are looking for specific colors or patterns, sometimes only blends are available in those colors/patterns. I have had many of my customers go from "I only buy 100% wools" to "bring on the blends!" once they've tried them. Sorry this post got so long! Any questions? I have really been enjoying all of your posts about the different types of wools but this post was easily my favourite. Thank you for spending the money, doing the work and taking the time to show and tell us about the different blends and felting qualities. I will be linking to this post later on next week! Thanks, Melissa! It was fun to do this post. Thanks for doing the hands-on research! 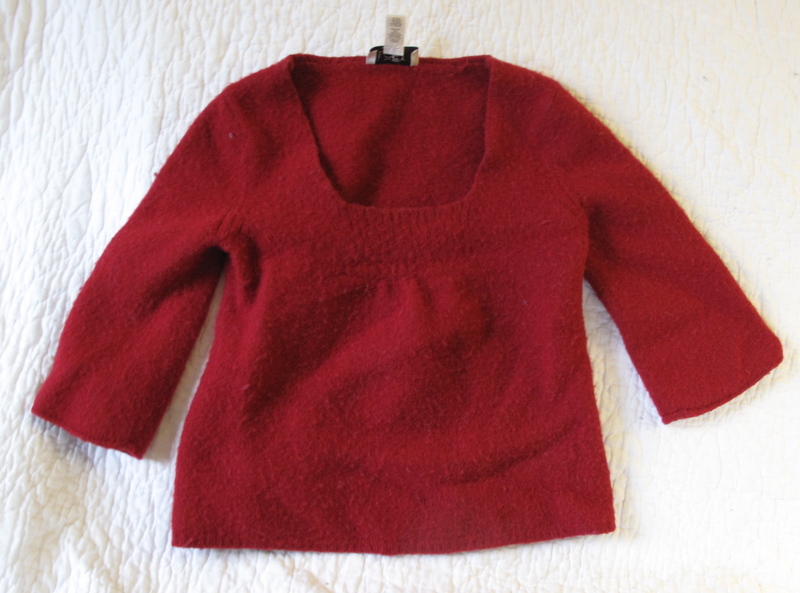 It's great to learn more about the "science" of sweater felting. A good reason to keep track of the fiber content on each sweater. Thanks for all your research. I've passed up plenty of sweaters that I thought wouldn't felt. Not that I'm having any shortage problems, but this does help me know when to take a chance on something with great color. I'm so glad you found this useful! Thanks! What a great post! I DO have a question--I can never get cashmere to felt, so I thought that it just doesn't felt. Do you think it is because I have a front load washing machine and there isn't enough agitation? Any suggestions? Are you sure it is not felted? Cashmere does not get stiff when felted, but remains soft & drapes. When it is felted, it will not unravel when cut, but it is usually just as soft as unfelted cashmere. Hmmm, I'll have to take a closer look. 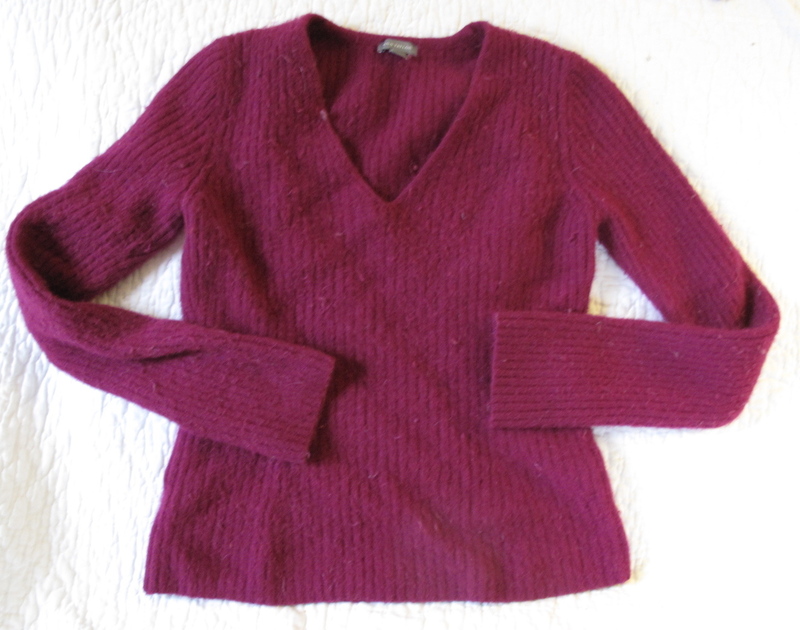 I always assumed the cashmere wasn't felted because it was still so soft, but maybe it is. Thanks for being such a great resource. You can always snip a little by a seam you were already planning to cut, and pull at the cut with your fingers to test if it is felted. I am so excited to read this post! I was sad when my knitting teacher told me that you can only felt blends with more than 85 percent wool, and I had some with 50 or 60% I am hoping to felt. It does pay to put info to the test! Thanks so much, Kris, for all you do to help us readers! I'm learning so much from you!! Thank you!! I love to resweater!!! Thanks for the info. Great help to me as I scout the Goodwill for cool sweaters to felt up for diaper covers. Thank you for doing this experiment and then posting the results! I am suddenly obsessed with wool, and felting wool, and just yesterday I passed up several nice sweaters at the thrift store because they were blends. Guess I'll get my shoes on and head back to get them! Really interesting, too, how unpredictable the results are. But for how cheap thrifted sweaters can be, it's worth the risk! $5.91 for 8 wool/wool blend "Things" at GoodWill/BestBuys today! Perfect reading... off to FELT! I have just knitted a 70% acrylic/30% wool scarf. Any ideas on how/if this may felt? I'm new to knitting and your blog is of great help! Thanks! I think even if the tag says 100% wool and it's superwash wool, it won't felt because it's chemically treated to prevent felting. I found your blog through a search. I have a question. Wondering if you may have a clue. Normally I wash anything that says, Handwash Only. I've also washed Dry Clean Only. Some things. I try to stay away from Dry Clean. 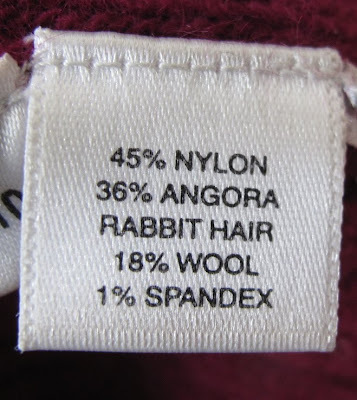 I would never have bought this sweater if I had read the label. 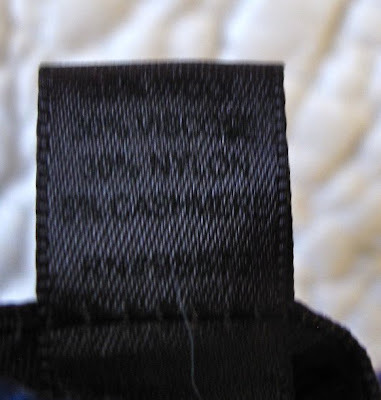 Lucky Brand is a weakness & so are clearance. Label: 54% Cotton 25% Acrylic 13% Polyester 5% Mettalique (that's a silver thread) 3% Wool. Normally I would go for it and wash the sweater. This is a sweater style coat. I am scared of that small amount of wool causing it to shrink. I have Samsung HE Washer. I have delicate, hand wash also a setting that doesn't spin. However I think it's not the water that would be the issue. I'd would like any ones opinions. I've been doing laundry over 40 years. I always wash. If I can't wash its going back to store. I'm just not the type to run to dry cleaners. Thanks. R.L.F., Sorry for the delay in response. I was having some trouble getting my comments. If you use a hand wash setting, the chance of it shrinking are very slim. Use cold water, and do not put it in the dryer, and you should be just fine! It's Tutorial Tuesday! Skirt to top! Off Topic Thursday - What's in your smoothies? Winner of the Resew book giveaway! I have 500 blog readers! Time for a sale!